On the first day of the visit of Chinese Premier Wen Jiabao, Chinese companies signed deals worth $ 16 billion with Indian counterparts. Ruling out the possibility of his ministry wading into the 2G spectrum scam, Corporate Affairs Minister Salman Khurshid today said he would discuss the issue of regulating corporate lobbying with other ministries following the storm over the Nira Radia tapes. The government today decided to double subsidy for micro, small and medium enterprises (MSMEs) in Jammu and Kashmir, at par with North Eastern states. It is business as usual for diamond units based in Mumbai and Surat even after the government has banned imports of rough diamonds from the Marange region of Zimbabwe, following pressure from Western countries. The ban came two months after diamond merchants in Gujarat came together under the banner of the Surat Diamond Sourcing Ltd (SDSL) to bid for rough stones. Indirect tax collection rose 42.3 per cent to Rs 2.07 lakh crore during April-November this year as compared to corresponding period last year, indicating an uptick in economic activities. Mobile phone banking kicks off in India with Axis Bank appointing Idea Cellular as its business corrospondent. The arrangement implies that the former’s financial products and services would be made available through the latter's retail outlets. There was enough space for the two Asian nations to grow and said China and India are partners for cooperation and not rivals in competition, Jiabao said. He was addressing industry leaders of the two countries at a meeting organised by the Apex chambers here. Jiabao is accompanied by a 200-strong business delegation. He also said China may open up some of its sectors to Indian firms and would discuss with Prime Minister, Manmohan Singh ways to substantially increase trade volumes. “China has become our largest trading partner in the world, though the balance of trade lies heavily in favour of China and we would like to take measures to reduce this deficit. Trade deficit with China will cross $24 billion this year. He said bilateral trade has witnessed ten-fold growth in the last six years and it has grown at double the rate at which our trade with the rest of the world has grown crossing $ 60 billion. “We would like to diversify our export basket which will provide opportunities of expanding non-traditional exports”, he said. 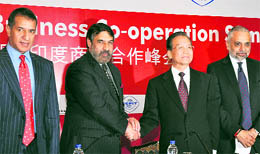 Sharma pitched for greater access for Indian companies in China given the huge trade deficit that India faces. He added as two large neighbours in Asia, there is bound to be an element of competition. “Though Chinese companies are involved in project contracts of nearly $ 40 billion in the power sector, and may be another $10 billion in telecom, equally so our companies seek to partner through investments in China’s growth story”, he said. He pushed for collaboration in pharmaceutical, bio-tech and healthcare spectrum as Indian pharmaceutical industry specially in the field of generics has acquired a global reputation. He said financial services sector is an area where India’s financial services sector has required considerable maturity over the years. There will be a greater demand for retail goods and luxury brands. Infrastructure is an area where India would like learn a lot from the Chinese experience. “Over the next decades we will be absorbing $ 1.7 trillion of investments in infrastructure alone and as we seek to expand our economic infrastructure, Chinese partnerships can be of immense value”, he said. "These (spectrum scam) are not company law-complaint issues entirely. These are issues that involved many other things that the concerned Ministry has to consider. I can't barge into any other Ministry's mandates and say I will look into it," Kurshid told reporters on the sidelines of India Corporate Week, an event inaugurated by the PM yesterday. On whether there was a move to ban or regulate corporate lobbying after the Radia tapes controversy, he said: “There is no law on this now. Today we do not have anything in the draft that is before Parliament. But we may have to find some other way of regulating it." Defending the practice of corporate lobbying, he said, "This is democracy. I see nothing wrong in a person promoting a particular point of view. That particular point will always be promoted sometimes generally person to person, sometimes sector to sector and sometimes industry to industry in front of the government." Following the leakage of conversations of corporate lobbyist Niira Radia with politicians, corporates and media persons, which have stirred a hornets' nest, Tata Group Chairman Ratan Tata has moved the Supreme Court against the leakage of tapes involving him and corporate lobbyist Niira Radia and further publication of the same. HDFC Chairman Deepak Parikh had also commented on telephone tapping and leakage of 'private conversations' saying that the morale of the industry has been hurt by such incidents. Lobbying is a legitimate business in countries like the US. However it is not recognised in India in statutory or non-statutory form. On the other hand, Diljeet Titus, senior partner of law firm Titus & Co said, "Lobbying, which basically means influencing government decisions externally, could invite Prevention of Corruption Act and may also go against the service rules for bureaucrats". The decision to modify the Central Capital Investment Subsidy Schemes for J&K was taken at a Cabinet meeting. Under the modified scheme, the Capital Investment subsidy for the MSME units in J&K will be enhanced to 30 per cent of the investment on Plant and Machinery against 15 per cent available at present, at par with the units in the NER. In addition, units, both in J&K and NER, will now be eligible to claim subsidy each time they undertake expansion as long as the total investment on plant and machinery does not exceed the prescribed ceilings. The limit for units in the manufacturing sector is Rs 10 crore and for the services sector Rs 5 crore. The scheme is one of the components of the industrial packages announced for J&K in June 2002 and for NER in April 2007, for boosting industrialisation in these states. The other industrial incentives include 100 per cent excise duty exemption, income tax exemption, interest subsidy of 3 per cent on working capital loan and reimbursement of comprehensive insurance premium on capital. These incentives are available to all new units for 10 years from the date of commencement of commercial production. It is business as usual for diamond units based in Mumbai and Surat even after the government has banned imports of rough diamonds from the Marange region of Zimbabwe, following pressure from Western countries. The ban came two months after diamond merchants in Gujarat came together under the banner of the Surat Diamond Sourcing Ltd (SDSL) to bid for rough stones. SDSL is seen as a major challenger to the Diamond Trading Company promoted by South Africa's De Beers, which controls more than half the global diamond trade. SDSL was to import $ 1.2 billion worth of diamonds from Zimbabwe every year. The deal drew flak from the Western countries, who are major buyers of diamond jewellery and the Indian government buckled under pressure to ban import of what is known as the Marange diamonds. "The imports of the diamonds will resume as soon as Zimbabwe and the regulators reach an agreement," says Sanjay Kothari, Chairman, Gem and Jewellery Export Promotion Council. The regulator, which functions through an agreement called the Kimberley process, keeps a check on trade of rough diamonds from conflict zones, put a stop on trading in Marange diamonds amidst allegations of human rights violations. Diamond traders in Mumbai, who also control the trade in Surat, said diamonds from Zimbabwe were finding their way into Mumbai for the past two years. “There is no shortage of rough stones. We are actually short of labour to polish the stones," says Amritlal Shah, who has diamond cutting and polishing units in Mumbai and Surat. The buzz in the industry is that the banned Marange diamonds were finding their way into the country via unofficial channels. "The roughs from Zimbabwe are much cheaper because of the ban,” says a Mumbai-based trader. Diamond importers who are signatories to the Kimberly Process are now said to be sending observers to Surat and other places to check trade in Marange diamonds from India. “Last year’s collections of Rs 1.45 lakh crore during the same period constituted an achievement of 54.5 per cent of the overall target fixed for indirect tax collections for the year 2009-10,” an official statement said. 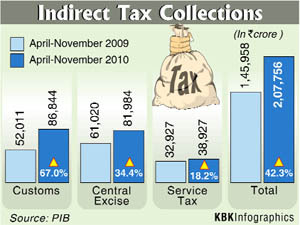 In the current year, indirect tax collections during April-November constitute 66.3 per cent of the overall target of Rs 3.13 lakh crore fixed for 2010-11. The indirect tax mainly constitutes customs, central excise and service tax. The Indian economy is already on a recovery path, registering a GDP growth of 8.9 per cent in the first half of the current fiscal. Similarly, the industrial output in October rose by 10.8 per cent on back of healthy performance of sectors such as automobile, electronic goods and power. The IIP growth rate on the average stood at 10.3 per cent during the April-October period. The revenue collections from customs have increased to Rs 86,844 crore during April-November 2010, which is 67 per cent higher than the previous year’s collections of Rs 52,011 crore in the same period. This constitutes an achievement of 75.5 per cent of the target of Rs 1.15 lakh crore for the whole year 2010-11, the statement said. The mop up from central excise also rose to Rs 81,984 crore during the period April-November 2010, an increase of 34.4 per cent over the previous year’s collection of Rs 61,020 crore during the same period. “These constitute an achievement of 62.8 per cent of the target of Rs 1.30 lakh crore fixed for the current financial year 2010-11," the statement added. The association will begin with a pilot project linking the Dharavi slum in suburban Mumbai and Allahabad in Uttar Pradesh, so that funds can be transferred between the two using a mobile phone platform, a press release said. Customers of Axis Bank will be able to transfer funds to the account of another Axis Bank account holder apart from remitting funds to an Idea Cellular customer without a bank account. Moreover the recipient would also be able to withdraw funds from an ATM, say sources. The next phase will see banking products like savings, credit, micro insurance, micro SIP and micro pensions being distributed via the mobile phone network, according to Axis Bank. Only in September last, the Reserve Bank of India permitted scheduled banks to rope in companies registered under the Indian Companies Act, 1956 to act as business corrospondents.